I love color! It can motivate you. It can help you relax. It can help you achieve your goals. And it can even help you get out of that funk you are in. 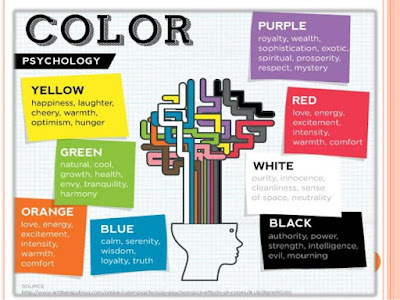 The Psychology of Color can be used to develop and communicate your brand image—who you are and how you want to be seen. Yes, the color you choose to wear sends a message to others about you at that moment in time. In fact, even the color you choose to paint the interior walls of your house communicates to the people who enter it who you are. But colors psychological affect goes beyond brand image. It affects your mental attitude. It affects your emotions. It affects your behavior. Color is made up of energy (Yep! We all learned about it in Science 101 - ultra magnetic spectrum). It has an unconscious power that many marketers leverage to get you to take action! Take McDonalds for instance. This Global fast food chain has profited by incorporating the colors red and yellow in its brand image. The color red and yellow trigger a person to be hungry resulting in them eating more, or more often. This is the very essence of McDonalds business—fast food. Brilliant marketing strategy! So, when you are picking out the color and style of your clothing, think about the image you would like to convey. When you are decorating your home, think about how you and others will feel when entering each room. 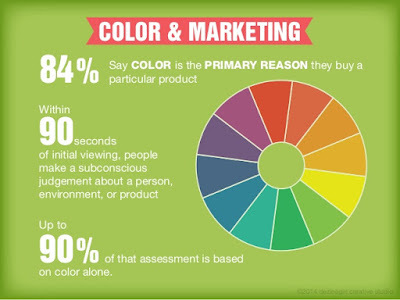 And if you are an entrepreneur, think about what colors will communicate your company and brands image - colors in marketing. Remember, each day is a new day; and each day can be a new color. affects of 9 of the most common colors. Also, when you add black and white to a color, it changes it's feeling and affect. Red is used to convey love. It is a high energy color. A color you wouldn't want to paint your childs bedroom. Red is a "look at me" color. People who wear red get noticed. Red also has been found to raise a person's blood pressure. It can create aggressive behavior. Orange is such a fun party color. It gives off the feeling of passion, sexuality, ambition. People drawn to the color orange are social, friendly and happy. Orange is a wonderful color to use in a marketing brainstorming room. Yellow creates a feeling of optimism. It's a very intellect and mental. It also can create a feeling of being controlling. This is one color you should never paint your child's room, unless it's a soft creamy yellow. Studies have found that kids have a more difficult time sleeping in a bright yellow room. Their mind just won't relax. Green is such a wonderful color to incorporate in your life. It's everywhere in nature. It symbolizes growth, healing and good luck. It can help you relax and be present. Many production companies have a green room where guests sit in, so they can relax before going on set. Hospitals use green to help create a calming feeling too. Blue is the color of communication. It's been found that wearing blue to an interview makes you appear reliable, loyal and honest. Blue is a great color to help you become more confident. Blue is also a wonderful color to paint a bedroom. And incorporating blue into your kitchen or getting a blue light inside your refrigerator can help overeating. It's an appetite suppressant. Where red is the opposite. Purple is a spiritual color. Preachers are often seen wearing it. It gives off a feeling of luxury and royalty. Purple is not a motivating color. Black has no color. It represents the unknown. Black gives off an energy vibe of death, mystery, and power. It is the most popular color in fashion. Many people are drawn to the color black when they are in a phase of questioning who they are and what they want to do for the rest of their life. This color represents mystery, secretive, power, death, and uncertainty. Black added to a color makes it more powerful. But it also can create a vibe that creates a negative feeling. Painting a room in dark purple, can make one more depressed and unmotivated. White is clean and fresh. It’s a great color to use when cleansing. White is used to give a feeling of sterile. Angels are white symbolizing truth and honesty. When white is added to another color it gives it an innocence. People appear gentle. Angels are white representing truth and honestly. An all white room can make you feel uncomfortable, hindering creativity. Brown grounds a person. This color represents your UPS man— he or she is reliable and trustworthy. You always know he’ll be on time. This color doesn’t make a statement when out in a crowd. It’s a color that blends in. If you want to be noticed, this is not the color you would want to wear. Wear it if you are looking to blend in and be everyone’s best friend. In summary, brown represents earthy, grounded, having common sense, credible, reliable, and politeness.